PBC is most frequently a disease of women and occurs between the fourth and sixth decades of life. 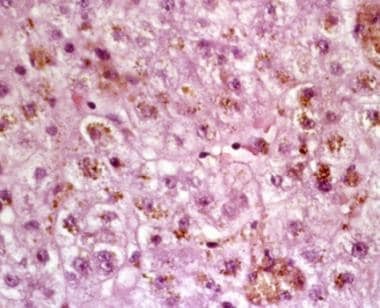 This histologic picture is compatible with stage 2 primary biliary cholangitis. Patients with profile A or B have a better disease course than patients with profile C or D.
Some patients have clinical, biochemical, and histologic features of PBC, but their sera are negative for AMA. The diagnosis of autoimmune cholangitis has been used for these patients. In patients with cirrhosis, follow-up imaging every 6 months with abdominal ultrasonography is suggested for early detection of hepatic malignancy. In patients with cirrhosis, an elevated bilirubin level is an ominous sign of disease progression, and liver transplantation must be considered. Liver transplantation appears to be the only life-saving therapeutic option. Primary biliary cholangitis (PBC), formerly known as primary biliary cirrhosis, is a chronic and progressive cholestatic disease of the liver. The name change reflects the fact that cirrhosis occurs only in the late stage and therefore does not correctly identify patients with early-stage disease. The etiology of this disease is unknown, although it is presumed to be autoimmune in nature. The major pathology of this disease is a destruction of the small-to-medium bile ducts, which leads to progressive cholestasis and often end-stage liver disease. In 1851, Addison and Gull described the clinical picture of progressive obstructive jaundice in the absence of mechanical obstruction of the large bile ducts. In 1950, Ahrens and colleagues named this disease primary biliary cirrhosis. As noted above, the term is controversial because cirrhosis only develops late in the course of the disease; therefore primary biliary cholangitis is preferred. Primary biliary cholangitis is most frequently a disease of women and occurs between the fourth and sixth decades of life. The symptoms may strongly affect patients' quality of life and may induce incapacitation. Various therapeutic approaches have been implemented with variable results; in selected candidates, liver transplantation is the only treatment option for the terminal stages of the disease. After the procedure, the disease has a relatively high recurrence rate despite immunosuppressive therapy. The image below demonstrates the histologic appearance of stage 2 primary biliary cholangitis. For patient education resources, see the Digestive Disorders Center and the Infections Center, as well as Cirrhosis. A continuous destruction of small and medium bile ducts occurs, which is mediated by activated CD4 and CD8 lymphocytes. As a result, chronic cholestasis is the prominent clinical and laboratory finding. Once destroyed, it is well established that regeneration of bile ducts is either not possible or inefficient. Subsequent to the loss of the intrahepatic bile ducts, a disruption of the normal bile flow occurs with retention and deposition of toxic substances, which are normally excreted into bile. The retention of toxic substances, such as bile acids and copper, can cause a further secondary destruction of the bile ducts and the hepatocytes. In addition, increased expression of the HLA class II antigens in the liver occurs, rendering the hepatocytes and bile duct epithelial cells more susceptible to activated T lymphocytes and perhaps exacerbating immunologically mediated cytotoxicity. An association has been suggested between primary biliary cholangitis and haplotype HLA-DR8 and, for some populations, HLA-DPB1. Genetic factors: First-degree relatives have a 570- to 1000-fold increased chance of developing primary biliary cholangitis. The presence of an inherited abnormality of immune regulation has been proposed. Infection with organisms of the family Enterobacteriaceae: Cross-reactivity between antigens on the bacterial wall and the mitochondria has been postulated. Patients with primary biliary cholangitis present with an increased incidence of gram-negative urinary tract infections. Although the epidemiology of primary biliary cholangitis has not been studied systematically, the published prevalence is 65.4 cases for women and 12.1 cases for men (40.2 cases overall) per 100,000 population. The incidence of the disease has been estimated as 4.5 cases for women and 0.7 cases for men (2.7 cases overall) per 100,000 population. Primary biliary cholangitis is reported to be more prevalent in the United Kingdom and Scandinavia. The prevalence of the disease has been estimated as 24 cases per 100,000 population in Newcastle, United Kingdom; 12.9 cases per 100,000 population in Northeast England; 1.9 cases per 100,000 population in Victoria, Australia; 2.2 cases per 100,000 population in Ontario, Canada; 2.7 cases per 100,000 population in Estonia; 9.2 cases per 100,000 in Malmö, Sweden; and 15.1 cases per 100,000 population in Umea, Sweden. Primary biliary cholangitis is more common in Northern Europeans and is less common in populations of African descent. Women account for 75-90% of patients with primary biliary cholangitis. Males who are affected have a disease course similar to that of females; however, men appear to be more likely to develop hepatocellular carcinoma. Primary biliary cholangitis mostly affects middle-aged women, with a mean age of 39 years. Onset usually occurs in persons aged 30-65 years. However, patients as young as 22 years and as old as 93 years at the time of diagnosis have been reported. The most reliable determinants of patient prognosis in primary biliary cholangitis are the height of the serum bilirubin level and the Mayo risk score. Published reports indicate that, when serum bilirubin values are constantly above 2, the mean survival rate is 4.1 years. When bilirubin levels are constantly above 6 mg/dL, the mean survival rate is 2.1 years. When bilirubin levels are constantly above 10 mg/dL, the mean survival rate is 1.4 years. A report reassessed the Mayo risk score, taking into consideration other factors found to be important in the timing of transplantation in patients with chronic cholestatic liver disease. Neither the height of the serum bilirubin level nor the Mayo risk score are invalidated by UDCA therapy. Treatment with UDCA before liver transplantation does not alter the posttransplantation outcome. In their report, Björnsson et al suggested that high fatigue levels can aid in predictions of liver-related mortality or liver transplantation need in patients with primary biliary cholangitis. Age [hazard ratio (HR) 1.1 (confidence interval (CI) 1.0-1.2)] and aspartate aminotransferase [HR 2.0 (CI 1.3-3.0)] were independently associated with decreased survival on multivariate analysis. FIS scores over 40 [HR 9.6 (CI 2.3-39.7)] and bilirubin [HR 4.8 (CI 2.8-8.2)] were independently associated with a poor outcome in patients who underwent transplantation or had a liver-related death. For asymptomatic patients with antimitochondrial antibody (AMA)–positive findings, a normal biochemical liver profile, and histologic features that are compatible with primary biliary cholangitis, the progression of the disease is relatively slow; however, the patient life expectancy is not identical to that of the general population. Of these patients, 40-67% develop symptomatic disease in approximately 5-7 years. Once they develop symptoms (mainly cholestasis) and remain untreated, the median patient survival duration ranges from 5.5-12 years. Generally, the median survival duration from the time of diagnosis is 7.5 years for patients who are symptomatic and 16 years for patients who are asymptomatic. Osteoporosis resulting from a decreased formation of bone has been found in one third of patients. Fat-soluble vitamin deficiency is a rare complication that is present in patients with long-standing hyperbilirubinemia. Hypercholesterolemia and hyperlipidemia have been identified in 85% of patients. Esophageal motility problems can occasionally occur, with asymptomatic or symptomatic reflux causing esophagitis and, possibly, stricture. This is more common in patients with CREST syndrome. Patients with jaundice can develop steatorrhea. This complication results from the decreased excretion of bile acids. Mild pancreatic insufficiency has also been reported. Renal tubular acidosis can be observed in approximately one half of patients with primary biliary cholangitis. Copper deposition in the renal tubules or an autoimmune phenomenon might be the mechanism for this complication. Hypothyroidism has been noted in 20% of patients with primary biliary cholangitis. Hepatocellular carcinoma can develop, with an overall incidence of approximately 6% (4.1% in women; 20% in men with advanced disease). Asymptomatic bacteriuria has been found in 35% of patients with primary biliary cholangitis. Autoimmune thrombocytopenia and hypoglycemia with insulin receptor autoantibodies may occur. Transverse myelitis and necrotizing myelopathy caused by vasculitis may occur. Xanthomatous peripheral neuropathy may occur. American Liver Foundation. Primary biliary cholangitis (PBC, primary biliary cirrhosis). March 29, 2016. Available at http://www.liverfoundation.org/abouttheliver/info/pbc/. Accessed: June 3, 2016. Ahrens EH Jr, Payne MA, Kunkel HG, Eisenmenger WJ, Blondheim SH. Primary biliary cirrhosis. 1950. Medicine (Baltimore). 1994 Sep. 73(5):264-78; discussion 278-80. [Medline]. Solis Herruzo JA, Solis Munoz P, Munoz Yague T. The pathogenesis of primary biliary cirrhosis. Rev Esp Enferm Dig. 2009 Jun. 101(6):413-23. [Medline]. McNally RJ, Ducker S, James OF. Are transient environmental agents involved in the cause of primary biliary cirrhosis? Evidence from space-time clustering analysis. Hepatology. 2009 Oct. 50(4):1169-74. [Medline]. Selmi C, Gershwin ME. The role of environmental factors in primary biliary cirrhosis. Trends Immunol. 2009 Aug. 30(8):415-20. [Medline]. Mendes FD, Kim WR, Pedersen R, et al. Mortality attributable to cholestatic liver disease in the United States. Hepatology. 2008 Apr. 47(4):1241-7. [Medline]. Niro GA, Poli F, Andriulli A, et al. TNF-alpha polymorphisms in primary biliary cirrhosis: a northern and southern Italian experience. Ann N Y Acad Sci. 2009 Sep. 1173:557-63. [Medline]. Drebber U, Mueller JJ, Klein E, et al. Liver biopsy in primary biliary cirrhosis: clinicopathological data and stage. Pathol Int. 2009 Aug. 59(8):546-54. [Medline]. Scheuer P. Primary biliary cirrhosis. Proc R Soc Med. 1967 Dec. 60(12):1257-60. [Medline]. [Full Text]. Charatcharoenwitthaya P, Pimentel S, Talwalkar JA, et al. Long-term survival and impact of ursodeoxycholic acid treatment for recurrent primary biliary cirrhosis after liver transplantation. Liver Transpl. 2007 Sep. 13(9):1236-45. [Medline]. Tsuda M, Moritoki Y, Lian ZX, et al. Biochemical and immunologic effects of rituximab in patients with primary biliary cirrhosis and an incomplete response to ursodeoxycholic acid. Hepatology. 2012 Feb. 55(2):512-21. [Medline]. US Food and Drug Administration. FDA approves Ocaliva for rare, chronic liver disease. May 31, 2016. Available at http://www.fda.gov/NewsEvents/Newsroom/PressAnnouncements/ucm503964.htm. Accessed: June 1, 2016. Edwards JE, LaCerte C, Pheng LH, et al. Sa1576 Exposure-response relationship of obeticholic acid for alkaline phosphatase and total bilirubin in patients with primary biliary cirrhosis (PBC). Poster presented at Digestive Disease Week; San Diego, California; May 21, 2016. Rudic JS, Giljaca V, Krstic MN, Bjelakovic G, Gluud C. Bisphosphonates for osteoporosis in primary biliary cirrhosis. Cochrane Database Syst Rev. 2011 Dec 7. 12:CD009144. [Medline]. Bjornsson E, Kalaitzakis E, Neuhauser M, et al. Fatigue measurements in patients with primary biliary cirrhosis and the risk of mortality during follow-up. Liver Int. 2010 Feb. 30(2):251-8. [Medline]. Balasubramaniam K, Grambsch PM, Wiesner RH, et al. Diminished survival in asymptomatic primary biliary cirrhosis. A prospective study. Gastroenterology. 1990 Jun. 98(6):1567-71. [Medline]. Ballardini G, Mirakian R, Bianchi FB, et al. Aberrant expression of HLA-DR antigens on bileduct epithelium in primary biliary cirrhosis: relevance to pathogenesis. Lancet. 1984 Nov 3. 2(8410):1009-13. [Medline]. Burroughs AK, Rosenstein IJ, Epstein O, et al. Bacteriuria and primary biliary cirrhosis. Gut. 1984 Feb. 25(2):133-7. [Medline]. Bush A, Mitchison H, Walt R, et al. Primary biliary cirrhosis and ulcerative colitis. Gastroenterology. 1987 Jun. 92(6):2009-13. [Medline]. Calmus Y, Gane P, Rouger P, et al. Hepatic expression of class I and class II major histocompatibility complex molecules in primary biliary cirrhosis: effect of ursodeoxycholic acid. Hepatology. 1990 Jan. 11(1):12-5. [Medline]. Christensen E, Crowe J, Doniach D, et al. Clinical pattern and course of disease in primary biliary cirrhosis based on an analysis of 236 patients. Gastroenterology. 1980 Feb. 78(2):236-46. [Medline]. Culp KS, Fleming CR, Duffy J, et al. Autoimmune associations in primary biliary cirrhosis. Mayo Clin Proc. 1982 Jun. 57(6):365-70. [Medline]. Dickson ER, Grambsch PM, Fleming TR, et al. Prognosis in primary biliary cirrhosis: model for decision making. Hepatology. 1989 Jul. 10(1):1-7. [Medline]. Elta GH, Sepersky RA, Goldberg MJ, et al. Increased incidence of hypothyroidism in primary biliary cirrhosis. Dig Dis Sci. 1983 Nov. 28(11):971-5. [Medline]. Gershwin ME, Selmi C, Worman HJ, et al. Risk factors and comorbidities in primary biliary cirrhosis: a controlled interview-based study of 1032 patients. Hepatology. 2005 Nov. 42(5):1194-202. [Medline]. Hoffmann RM, Pape GR, Spengler U, et al. Clonal analysis of liver-derived T cells of patients with primary biliary cirrhosis. Clin Exp Immunol. 1989 May. 76(2):210-5. [Medline]. Janes CH, Dickson ER, Okazaki R, et al. Role of hyperbilirubinemia in the impairment of osteoblast proliferation associated with cholestatic jaundice. J Clin Invest. 1995 Jun. 95(6):2581-6. [Medline]. Jones DE, Metcalf JV, Collier JD, et al. Hepatocellular carcinoma in primary biliary cirrhosis and its impact on outcomes. Hepatology. 1997 Nov. 26(5):1138-42. [Medline]. Kaplan MM, Elta GH, Furie B, et al. Fat-soluble vitamin nutriture in primary biliary cirrhosis. Gastroenterology. 1988 Sep. 95(3):787-92. [Medline]. Keller DM. Beta blockers ameliorate GI permeability in cirrhosis. Medscape Medical News from WebMD. May 2, 2013. Available at http://www.medscape.com/viewarticle/803542. Accessed: May 14, 2013. Kim WR, Lindor KD, Locke GR 3rd, et al. Epidemiology and natural history of primary biliary cirrhosis in a US community. Gastroenterology. 2000 Dec. 119(6):1631-6. [Medline]. Klein R, Huizenga JR, Gips CH, et al. Antimitochondrial antibody profiles in patients with primary biliary cirrhosis before orthotopic liver transplantation and titres of antimitochondrial antibody-subtypes after transplantation. J Hepatol. 1994 Feb. 20(2):181-9. [Medline]. Lacerda MA, Ludwig J, Dickson ER, et al. Antimitochondrial antibody-negative primary biliary cirrhosis. Am J Gastroenterol. 1995 Feb. 90(2):247-9. [Medline]. Liermann Garcia RF, Evangelista Garcia C, et al. Transplantation for primary biliary cirrhosis: retrospective analysis of 400 patients in a single center. Hepatology. 2001 Jan. 33(1):22-7. [Medline]. Lindor K, Dickson R. Primary biliary cirrhosis. Schiff ER, Sorrell MF, Maddrey WC, eds. Schiff's Diseases of the Liver. 8th ed. Lippincott-Raven: Philadelphia; 1999. Vol 1: 679-92. Mahl TC, Shockcor W, Boyer JL. Primary biliary cirrhosis: survival of a large cohort of symptomatic and asymptomatic patients followed for 24 years. J Hepatol. 1994 Jun. 20(6):707-13. [Medline]. Mang FW, Michieletti P, O'Rourke K, et al. Primary biliary cirrhosis, sicca complex, and dysphagia. Dysphagia. 1997 Summer. 12(3):167-70. [Medline]. Marx WJ, O'Connell DJ. Arthritis of primary biliary cirrhosis. Arch Intern Med. 1979 Feb. 139(2):213-6. [Medline]. Nakanuma Y, Tsuneyama K, Kono N, et al. Biliary epithelial expression of pyruvate dehydrogenase complex in primary biliary cirrhosis: an immunohistochemical and immunoelectron microscopic study. Hum Pathol. 1995 Jan. 26(1):92-8. [Medline]. Newton JL, Gibson GJ, Tomlinson M, Wilton K, Jones D. Fatigue in primary biliary cirrhosis is associated with excessive daytime somnolence. Hepatology. 2006 Jul. 44(1):91-8. [Medline]. Pares A, Rimola A, Bruguera M, et al. Renal tubular acidosis in primary biliary cirrhosis. Gastroenterology. 1981 Apr. 80(4):681-6. [Medline]. Parikh-Patel A, Gold E, Mackay IR, et al. The geoepidemiology of primary biliary cirrhosis: contrasts and comparisons with the spectrum of autoimmune diseases. Clin Immunol. 1999 May. 91(2):206-18. [Medline]. Pares A, Caballeria L, Rodes J. Excellent long-term survival in patients with primary biliary cirrhosis and biochemical response to ursodeoxycholic Acid. Gastroenterology. 2006 Mar. 130(3):715-20. [Medline]. Reynolds TB, Denison EK, Frankl HD, Lieberman FL, Peters RL. Primary biliary cirrhosis with scleroderma, Raynaud's phenomenon and telangiectasia. New syndrome. Am J Med. 1971 Mar. 50(3):302-12. [Medline]. Ricci P, Therneau TM, Malinchoc M, et al. A prognostic model for the outcome of liver transplantation in patients with cholestatic liver disease. Hepatology. 1997 Mar. 25(3):672-7. [Medline]. Roll J, Boyer JL, Barry D, et al. The prognostic importance of clinical and histologic features in asymptomatic and symptomatic primary biliary cirrhosis. N Engl J Med. 1983 Jan 6. 308(1):1-7. [Medline]. Ros E, Garcia-Puges A, Reixach M, et al. Fat digestion and exocrine pancreatic function in primary biliary cirrhosis. Gastroenterology. 1984 Jul. 87(1):180-7. [Medline]. Rutan G, Martinez AJ, Fieshko JT, et al. Primary biliary cirrhosis, Sjogren's syndrome, and transverse myelitis. Gastroenterology. 1986 Jan. 90(1):206-10. [Medline]. Selinger S, Tsai J, Pulini M, et al. Autoimmune thrombocytopenia and primary biliary cirrhosis with hypoglycemia and insulin receptor autoantibodies. A case report. Ann Intern Med. 1987 Nov. 107(5):686-8. [Medline]. Shapiro JM, Smith H, Schaffner F. Serum bilirubin: a prognostic factor in primary biliary cirrhosis. Gut. 1979 Feb. 20(2):137-40. [Medline]. Thomas PK, Walker JG. Xanthomatous neuropathy in primary biliary cirrhosis. Brain. 1965 Dec. 88(5):1079-88. [Medline]. Yamada G, Hyodo I, Tobe K, et al. Ultrastructural immunocytochemical analysis of lymphocytes infiltrating bile duct epithelia in primary biliary cirrhosis. Hepatology. 1986 May-Jun. 6(3):385-91. [Medline].